The DJ-202 is a forward-thinking Serato DJ Intro controller. It has the features and layout of a full-size pro controller wrapped into a rugged mobile package. But while supplies last, customers who buy a DJ-202 in the U.S. can also upgrade to Serato DJ for free. Roland DJ-202 DJ Controller Demo. Features for the DJ-202 include two low-latency platters, a built-in drum machine with TR-808 and TR-909 sounds, and eight dedicated pads. The onboard 16-step sequencer (accessible via the performance pads) controls the Serato DJ Intro sampler to create on-the-fly vibe, and the controller can function as USB audio/MIDI interfaces (with 24-bit/48 kHz fidelity and high-resolution digital-to-analog converters). There’s even a MIDI output included to control and sync external devices, along with a 1/4-inch mic input with gate, hi-pass, reverb, and echo FX. Plus, with Serato DJ, expansion packs, MIDI mapping, full sync, and quantize capabilities are also at your fingertips. To learn more about the differences between Serato DJ and Serato DJ Intro, visit https://serato.com/upgrade. The backbone of any great DJ is solid equipment and an arsenal of the latest and greatest tracks. With over 60,000 songs across multiple genres, BPM Supreme provides an unlimited palette of music with high-quality MP3 downloads and music videos for creating masterpieces. The BPM Supreme Standard membership typically costs $19.99 per month, but it’s free for 90 days for U.S. customers who register their new DJ-202 through March 31, 2018. Register at https://www.roland.com/us/backstage/register_products/ to receive a redemption code via email, and visit https://roland.bpmsupreme.com/ to redeem. 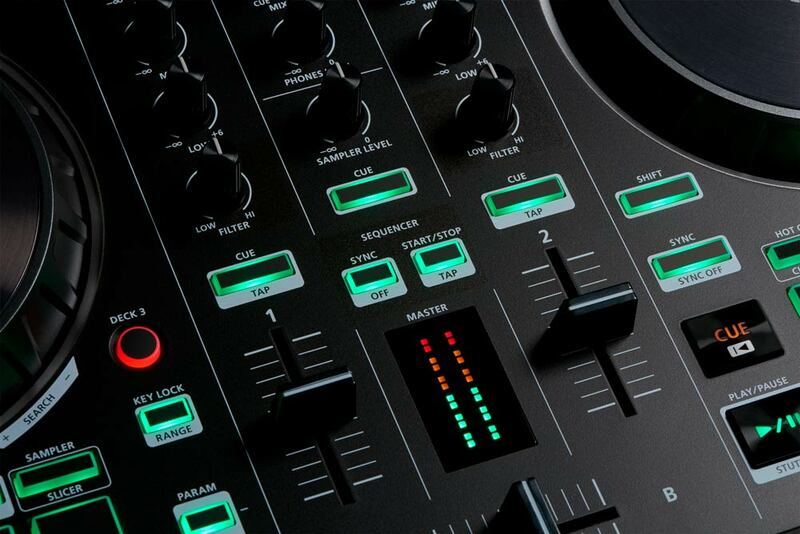 The DJ-202 is a state-of-the-art DJ controller that will take DJing to a whole new performance frontier. With its intuitive panel layout and hands-on controls, anyone can use the DJ-202 to start creating music right away. But the fastest way to unlock the DJ-202’s full creative potential is by learning about its deeper features and functions. Roland Cloud Academy DJ-202 live training puts performers on the fast track to get the most out of this controller and themselves. Roland offers live sessions a few times each month that are accessible via any device with a web connection. U.S. customers can gain access to training by first registering a newly purchased DJ-202 at https://www.roland.com/us/backstage/register_products/. *Free U.S. DJ-202 bundles available at participating authorized U.S. Roland DJ dealers while supplies last.